Cold breakfast cereal is a pantry staple in most houses, but who invented it? The origin of cereal can be traced the 1800s. Read about the inspiration and evolution of this easy breakfast. In 1863, at the Danville Sanitarium in Danville, NY, a vegetarian wellness retreat that was popular with health-conscious Gilded Age Americans, Dr. James Caleb Jackson challenged guests more accustomed to beef or pork for breakfast to try his powerful, concentrated grain cakes. "Granula," as he called it, required soaking overnight to be edible in the morning, and even then wasn’t so appetizing. But one of his guests, Ellen G. White, was so inspired by his vegetarian lifestyle that she incorporated it into her Seventh-Day Adventist Church doctrine. One of those early Adventists was John Kellogg. Kellogg’s brother, Will Keith Kellogg, worked with him at the sanitarium. Together, the brothers tried to come up with breakfast items more wholesome and easier on the bowel than meat. They experimented with boiling wheat and rolling it into sheets, then grinding it. One evening, in 1894, they forgot about a pot of wheat and the next morning, rolled it out anyway. The wheat berries didn’t cohere into a sheet but rather emerged as hundreds of flakes. 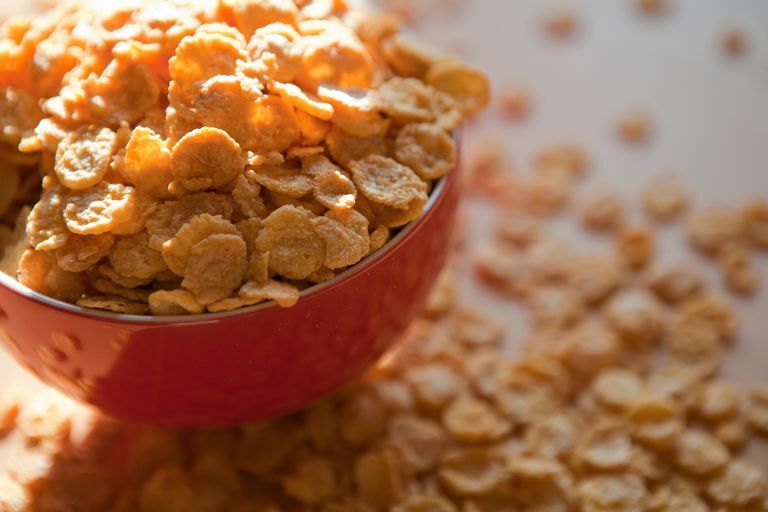 The Kellogg's toasted the flakes….and the rest is breakfast history. W.K. Kellogg was something of a marketing genius. When his brother wouldn’t go big their endeavor—fearing it would damage is reputation as a doctor—Will bought him out and, in 1906, packaged corn and wheat flakes for sale. Another visitor to the Battle Creek Sanitarium was a Texan named Charles William Post. C.W. Post was so affected by his visit that he opened his own health resort in Battle Creek. There he offered guests a coffee substitute he called Postum and more bite-sized version of Jackson’s Granula, which he called Grape-nuts. Post also marketed a corn flake that became hugely successful, called Post Toasties. A funny thing happened on the way from the sanitarium, though. Quaker Oats, the oldest hot cereal company, having been founded on the success of oatmeal, acquired puffed-rice technology in the early 20th century. Soon puffed cereals, stripped of fiber (it was thought injurious to digestion) and laden with sugar to induce children to eat, became the norm. Cheerios (puffed oats), Sugar Smacks (sugary puffed corn), Rice Krispies, and Trix wandered far from the healthful aims of America’s early breakfast cereal barons, earning billions of dollars for the multi-national food corporations that grew in their stead. "The Graham Cracker Diet" Was Totally a Thing!